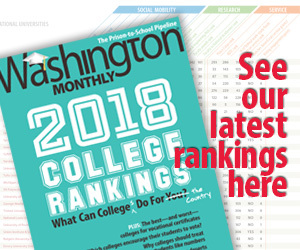 Washington Monthly | The Palestine Vote: What Has Changed? The Palestine Vote: What Has Changed? Even though it is not yet clear what the United Nations General Assembly (UNGA) will vote on, the prospect of a vote on Palestinian UN membership or observer state status is already causing both anticipation and anxiety.I plan to do a number of posts on this issue in the coming days; starting with an attempt to put the current situation in the context of the ample history of UNGA votes on the Palestinian issue. In most years, the UNGA holds between 20 and 30 controversial votes on issues related to Israel. Analyzing these data allows us to look at how voting has evolved and what countries are more and less likely to support Israel. Let’s start with the dynamics. Some observers and journalists describe the vote as “a global expression of discontent against the government of Prime Minister Benjamin Netanyahu.” They argue that Israel has become increasingly isolated in recent years due to the current government’s intransigence on settlements and other issues. So how has Israel’s isolation in the UNGA changed? The figure below looks at trends (by region) since 1985. Before interpreting the graph, I should briefly explain the numbers, which come from joint work with Michael Bailey. 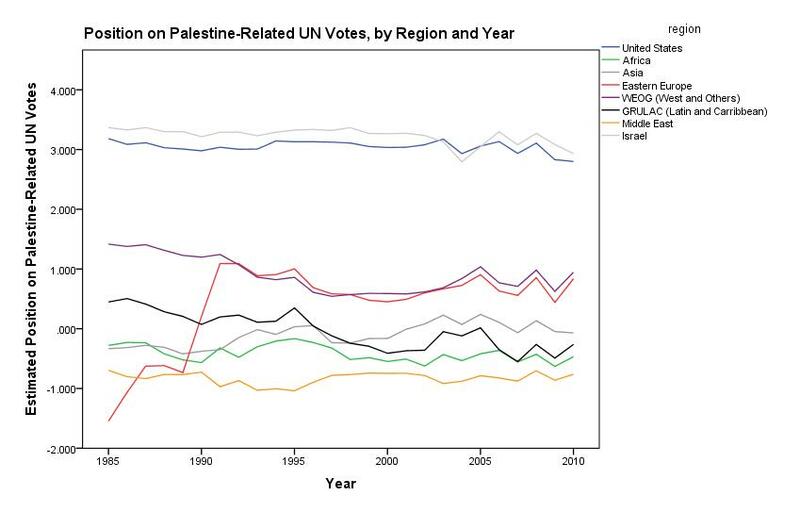 Perhaps the most obvious thing would be to simply plot the percentage of states that vote with Israel each year. There is, however, an important downside to this. If states keep introducing new resolutions on which they know Israel will be isolated, then the percentage of states that vote with Israel will drop regardless of whether states actually stopped supporting Israel. To deal with this problem we adopt a methodology that Mike developed for US institutions and that Erik applied to the UNGA (gated). Essentially, we use the fact that some UNGA resolutions are identical across years. We fix these resolution parameters across time, which allows us to separate agenda change from preference change. So what does the graph show? What really jumps out is the consistency in the gap between Israel, the U.S., and most other countries. Moreover, the biggest changes followed the end of the Cold War; not changes in Israeli policies. After the end of the Cold War, Eastern European states suddenly became much more favorable towards Israel. Western European and Latin American states gradually dropped their support when released from the shackles of Cold War politics. 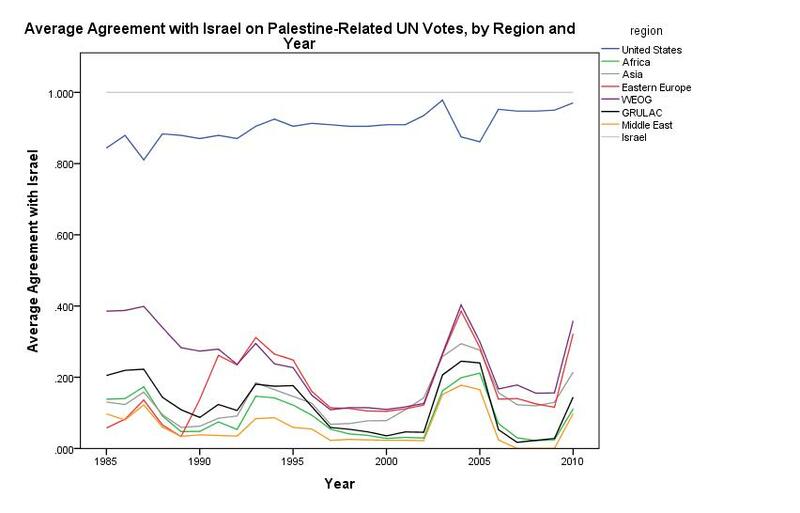 One reaches a similar conclusion by simply looking at the average percentage of states within a region that vote with Israel; although the trends are much noisier as they don’t filter out agenda changes (see the graph below). Israel has always been isolated in the UNGA on Palestine-related votes and there is no evidence that this isolation has increased due to the policies pursued in the past few years by the Netanyahu government (which may well be deplorable for other reasons). Now, these UN votes don’t capture everything and it may well be that specific actions by Israeli governments have made it more difficult for some governments to support Israel. Or it could simply be that the Israeli government has not varied its policies sufficiently to register in preference shifts. Yet, the point remains that the disagreements have been a structural feature of global politics for some time. What has changed then, are not so much the preferences of states but the relative power and resolve of those states most supportive of Palestine. States like China, India, and Turkey have grown much more powerful in relative terms over the past decade. Moreover, domestic changes in Turkey and much of the Arab world have given leaders greater incentives to take more risky actions in support of the Palestinian cause. A key question, of course, is how the “states in the middle” respond to this changed situation. I will take on this question in a future post, where I’ll analyze in more detail which states are most likely to support Israel.